Parent tattoos designed by your kids aren't something you would think happens. Hanging your kids drawing on the fridge is one thing, wearing it as a tattoo is something else entirely. And something that many parents would be only to happy to never let happen. But not all parents, as the latest from Cut Video illustrates. It begins with a cute little kid saying "daddy's getting a tattoo.....are you bleeding yet?" as his dad sits in the tattoo artist's chair getting inked. Scared yet? The premise of the video is that the moms and dads declaring that they'll get 'parent tattoos' of whatever their kid draws or designs, which they declare while looking quite anxious. Then, after a brief discussion, the kids do a doodle of what they think their parents' next tattoo should look like. For one of the anxious parents, it's their first ever tattoo, for the other two it's just simply their latest, and no doubt most experimental, addition. Suddenly the idea of parent tattoos becomes reality as they prepare to go under the needle. What makes things worse is parents have no idea what their kids have in mind for a design. Nerves are clearly on show from the outset, as the parents iterate that whatever it is their kids do, their parent tattoos will be on them forever (or until they can get it lasered off). "I just want something that comes from the heart." says one mom. "A hotdog." comes her son's reply. Oh dear. So the little boy sets about drawing a hotdog, but a kind of hotdog man in a top hat with a cane. Another little girl draws some characters from Beauty and the Beast, but pared down versions in the stick figure style that kids are experts in. While another little boy designs his dad a tattoo of a flying dragon snake with monster horns. Cool tattoos and tattoo designs obviously vary very differently depending on whether you are a parent or a kid. Then, once the designs are completed, the kids make some suggestions as to where their parent tattoos should go. Arms, back, legs, then it's off to the tattoo parlor to get inked! And off they go, with the kids looking on with anticipation, everyone waiting to see what the finished article comes out like. For the parents it seems like a horror show but the kids really, really seem to enjoy the tattoo process, firing off questions about how many needles are used and whether it hurts. One kid even jumping up and down with excitement while his dad grimaces in the background. "You look like it hurts a lot" one little kid says to her mom. Finally, the wait is over and everyone gets to see the parent tattoos in the form of designs made flesh, at it were. "It's a masterpiece." declares the hotdog kid. "It is a masterpiece" she replies, trying to sound convincing. And, why that might be subjectively open to debate, the end results don't look too bad really. 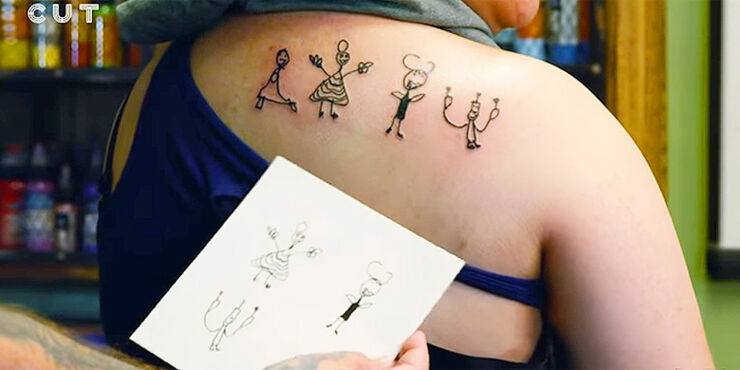 Obviously they look like a kid's drawing, but at least their parent tattoos are highly personal—and unique. See more from Cut Video at their YouTube channel.